Frances was born in Glasgow. From about the age of four when she was a promising young gymnast and dancer, and at the age of ten, drama classes had also been added to the agenda of a very busy young lady. When her family ‘discovered’ that she could also sing, they decided to put Frances forward for an audition at Glasgow Academy Musical Theatre Arts (GAMTA) which is the leading independent musical theatre training establishment in Scotland and has been producing highly successful and versatile theatrical performers since 1994. 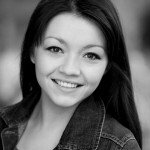 Theatre: Princess Jasmine in Aladdin (Churchill, Bromley), lead vocalist in Highland Heartbeat (His Majesty’s Theatre, Aberdeen, and USA tour), Princess Jasmine in Aladdin (King’s, Glasgow), dance captain in Beauty and the Beast and Snow White in Snow White (SECC, Glasgow). Television: Mia in River City, Shona in Lip Service, series finalist for Britannia High, Survival Squad in Against All Odds and Highland Heartbeat feature on STV’s The Hour and PBS in the USA. Frances very kindly agreed to answer some questions about herself and her career. Are there any long-term ambitions? “You know I have played the lottery numerous times and never even come close to winning a ‘tenner’, so have no chance of being a millionaire (ha ha), but if I did I would love to take my family on a big holiday and visit my Gran in Hong Kong! I’d give a bit of money to my Dad as he paid for my training which I’m really grateful for! Who is your favourite actor and who is your favourite actress? Do you have any favourite ‘sayings’? Which is your favourite part of London? Do you have a favourite colour in your wardrobe? I wear lots of different colours and often change my style depending how I feel! I have A LOT of clothes! I do a lot of shopping in top-shop, H&M and AllSaints, but also like vintage shopping! I think my wardrobe and style is very eclectic! I also have a lot of shoes, one might say too many! I am a big ‘foodie’, my whole family is, even my dogs! It’s a McCann thing! I don’t eat much Indian food, so I like to go for a curry from time to time. I eat Chinese food back home, fresh, traditional dishes that my mum prepares so I don’t go out for Chinese often as it doesn’t compare to my mum’s! Frances is undoubtedly a very talented young actress who I am sure will continue to be a great success on the stage, and in particular the West End.